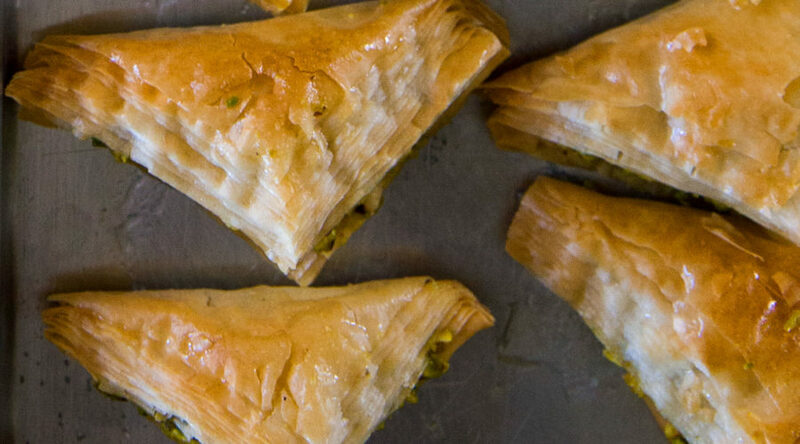 Unlike classic layered baklava, these glistening turnovers from Syrian baker Noor Al Mousa of Mesa, Arizona aren’t filled with nuts until after the pastries come out of the oven. To make them, she folds stacks of filo into triangles and generously butters only the outside before baking—not between the layers, which would glue them together and make them difficult to fill. Al Mousa is part of the Syrian Sweets Exchange organization and sells her pastries at the Scottsdale farmers’ market. Make syrup: In a medium saucepan over medium heat, bring granulated sugar and 1 cup water to a boil, stirring occasionally. Add lemon juice. Reduce heat to an active simmer and cook, stirring occasionally, until slightly thickened and reduced to a scant 1 3/4 cups, 10 to 12 minutes. Remove from heat, stir in 1 tsp. orange blossom water, and let syrup cool. Preheat oven to 350°. Make filling: In a large bowl, combine 1/4 cup of the syrup with remaining 1/2 tsp. orange blossom water, 2 tbsp. clarified butter, and the superfine sugar. Toss with pistachios. On a work surface, stack the (unbuttered) filo sheets and cut into 3-in. squares, discarding scraps. Fold each stack over on itself to form a triangle and set triangles slightly apart on a buttered rimmed baking sheet. Using a pastry brush, very generously dab tops and edges of triangles with the remaining 1/4 cup clarified butter, letting some flow onto pan. Bake, rotating halfway through, until medium golden, 15 to 18 minutes. Let stand just until cool enough to handle, about 5 minutes. Gently open a pocket in center of each triangle and fill with a rounded tbsp. of nut mixture. Set each filled pastry back in pan so that it touches the others. Using a soup spoon, evenly coat warm baklava with 1/2 cup syrup. (Save remaining syrup for other uses.) Let stand at least 2 hours for filling to firm up.